Greg Fuchs (ApplPhys, co-leader), Gennady Shvets (ApplPhys, co-leader), Nicole Benedek (MatSci), Debdeep Jena (ElecE), Jeffrey Moses (ApplPhys), Farhan Rana (ElecE), Alejandro Rodriguez (ElecE, Princeton), A. Nick Vamivakas (Optics, U. Rochester), Huili Grace Xing (MatSci). The goal of this newly proposed IRG is to understand, create, and harness exceptionally strong light-matter interactions for scientific discoveries and future photonic information processing technologies. To date, optical information processing has been limited by the fact that photons typically interact only very weakly with each other; this IRG will aim to generate orders-of-magnitude enhancements in light-matter interactions, and hence light-light coupling mediated by these interactions. 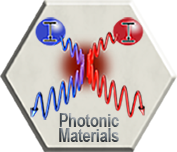 Our strategy is to unite materials and photonics expertise to develop new “structured materials,” consisting of thin layers and thin-film heterostructures designed to provide unique optical properties (e.g., stronger nonlinearities or better efficiency as single-photon sources compared to existing materials) which are then sculpted – sometimes in non-intuitive ways – to control light-matter interactions down to the nanoscale. If successful, this research will enable new, small-footprint optical information-processing platforms capable of operating at high speeds, with extremely high efficiency, at low power, and in some cases, in advanced quantum technologies.